Is a site that should not be missed. There is a small mole but due to the day cruises a spot is difficult to find. You can anchor off and go with the dingy. No yachts are permitted after 1700 hrs. Despite its diminutive size, Delos is one of the most important archaeological sites in Greece, and certainly the most important in the Cyclades. Delos was a place of such importance that the surrounding islands were known as the Cyclades, since it was thougth that they lay in a circle round the island on which the god Apollo was born. According to mythology, Leto, pursued by Hera, found refuge on a floating rocky island, which Poseidon then anchored to the sea bottom with pillars of granite. Here, under the palm, she bore to Zeus the twins Apollo and Artemis, attended by Arge and Opis, two maidens from the hyperborean regions of the north, which god was required to visit annually. 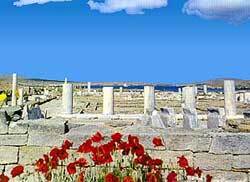 From the 7th century BC, Delos was under the influence of Naxos, which promoted the development of the sanctuary. In the 6th century BC, Peisistratos carried out a "purification" of the island, with the removal of all tombs (apart from the two hyperborean maidens) from Delos to the neighboring island of Rheneia. Athenians coveted Delos for a long time, seeing its strategic position as one from where they could control the Aegean, and by the 5th century it had come under their jurisdiction. At that time, Delos became the headquarters of the Delian Confederacy, a maritime league under the leadership of Athens, but in 454 BC the Athenians carried off the treasury of the league and deposited it on the Acropolis. 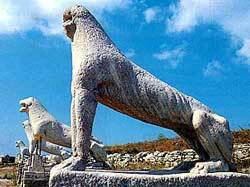 In 314 BC Delos broke away from Athens to become independent and therefore enjoyed a period of great prosperity. The island reached its height in Hellenistic times, becoming one of the 3 most important religious centers in Greece and a flourishing center of commerce. It traded through the Mediterranean and was populated with wealthy merchants, mariners and bankers from as far away as Egypt and Syria. These inhabitants built temples to the various gods worshipped in their countries of origin, although Apollo remained the principal deity worshipped on the island. In 166 BC the Romans declared Delos a free port, which promoted its development as a trading center and led to the growth of a considerable commercial town. In 88 BC it was sacked by Mithridates and 10.000 inhabitants were massacred. From then on, Delos was prey to pirates, and later, also to looters of antiquities. The french School of Archeology has been responsible for the exploration of the site; excavations, begun in 1872, have been carried out in parallel with those at Delphi. In 1904 with the aid of a patron, the Duc de Loubat, M. Holleaux began the "great excavation" which uncovered public buildings and private houses; some have been partially reconstructed by the Greek Anastylosis Service. Work is still in progress particularly in a Hellenistic district to the north.